The first result is that Republicans consolidated the power they had won in 2010. Despite some key Democratic victories, 53 percent of Americans live in states where Republicans control both the legislature and the governorship. Republicans took state policy in a more conservative direction during the last two years, and fought back against President Obama’s policies. Nothing that happened November 6 will prevent them from doing the same thing again in the next two years. If the biggest obstacle to the president’s second-term agenda is the Republican-controlled U.S. House, the second biggest obstacle will be Republican power in the states. The other major result was that Republicans won more power in states that were already Republican, while Democrats won more power in states that were already Democratic. That outcome creates the possibility that, even more than in the last two years, policies in Republican-controlled states and Democratic-controlled states will diverge. The campaigns the two parties have just waged suggest that on everything from gay marriage and gun control to taxes, schools and business regulation, Republicans and Democrats will enact very different policies in the states they lead. But the outcome may not be quite as simple as it first appears. As evidence of that, consider Brian Sandoval, the governor of Nevada. Sandoval has served as a reminder that candidates who campaign as rigid ideologues don’t always govern that way. When he ran in the Republican primary for governor in Nevada in 2010, Sandoval campaigned as an even more vehement critic of tax increases than his opponent Jim Gibbons, one of the most anti-tax governors in the country. Yet in his first year in office Sandoval allowed the continuation of temporary state tax increases that were set to expire. This year, he supports allowing the higher taxes to continue again. In December, Sandoval even announced his support for a new local sales tax increase in Clark County, where more than two-thirds of Nevada’s population lives. Sandoval’s about-face on taxes is a clear reminder that the meaning of election results isn’t always obvious until the winners begin to govern. The same will hold true in the year ahead. Each party has the power to enact a sweeping agenda in the states it controls. But the extent to which they will use that power isn’t clear yet. By some measures, Democrats had a successful election night on November 6 at the state level, just as they did at the federal level. The party won seven of the eleven gubernatorial contests on the ballot. It gained legislative seats and legislative chambers. The results left Republicans with a relatively narrow advantage in legislative seats nationwide, 52 percent to 47 percent. Yet, in the ability to enact an agenda, Republicans remain dominant. Of the nation’s ten most populous states, seven — Texas, Florida, Pennsylvania, Ohio, Georgia, Michigan and North Carolina — have Republicans holding the governorship and both houses of the legislature. All told, 166 million people live in the 25 states where Republicans have united legislative and gubernatorial control, compared to just 93 million in the 13 states where Democrats are in charge. Republicans now have an opportunity to maintain the lead role in state policy-making for years to come. Most gubernatorial elections take place in midterm years, when turnout among key Democratic constituencies such as young voters and minorities tends to be lower. Plus, in many states, including some that President Obama won, such as Michigan, Ohio and Wisconsin, Republicans have put in place district lines that could give them an advantage in state legislatures for the next decade. Partisan redistricting is one reason control is concentrated in the hands of one party or the other in so many states. But, more than that, the concentrations of power are a reflection of the way red states have become more reliably red, just as blue states have become more reliably blue. In presidential politics, there are 22 consistently red states: states the Republican presidential nominee carried in all four elections from 2000 to 2012. In 20 of them, the legislature has become more Republican over the last ten years — and many of them were already Republican-controlled to begin with. Likewise, of the 18 reliably blue states in presidential elections, 16 of them have seen their legislatures become more Democratic over the same time period. The result is that in many legislatures the majority party outnumbers the minority by two, three or four to one. In 22 states, one party has a veto-proof majority in both chambers, representing a substantial increase in veto-proof power over the last ten years. Yet those legislatures probably won’t have to consider many veto overrides: In 19 of the 22 states, all but Arkansas, Missouri and Rhode Island, the governor is of the same party as the legislative majority. What all this means is that in most states the majority party now has the power to enact virtually anything it pleases, as long as it remains united. As a result, one of the central questions of the next two years is how bold Republicans and Democrats will choose to be in the places where they are running things. For Republicans in particular, going bold has been one of the dominant strategies of the last two years. The most recent example is in Michigan, where last month the Republican legislature and Governor Rick Snyder approved right-to-work legislation, a move that will inflame union outrage for the next two years in one of the most unionized states in the country. Snyder governs a state that President Obama won in 2012 by nearly 10 percentage points. If Republicans are willing to push for dramatic policy changes in Michigan, one can argue that they will be apt to do so in any state where they have the power. In some places, it’s clear they will. In North Carolina, Republican Pat McCrory’s election as governor means the G.O.P. has complete control of the state for the first time in modern history. John Hood, the president of the John Locke Foundation, a conservative North Carolina think tank, expects Republicans to approve a voter I.D. law, consider tax credits for private school scholarships, lighten business regulation and contemplate a major tax overhaul, potentially including elimination of the income tax entirely. Likewise, earlier this month two other Republican governors, Louisiana’s Bobby Jindal and Nebraska’s Dave Heineman, both asked their state lawmakers to end the income tax—something no state has done since Alaska in 1980. This divergence between Democratic and Republican ideas is equally pronounced when it comes to social issues. In Texas, for example, Lieutenant Governor David Dewhurst, who presides over the Senate, told the Associated Press in December that he wants Texas to be “the most fiscally and socially conservative state in the country.” That means bills to further restrict abortion, help children attend private schools and allow police to question the immigration status of people they arrest. Meanwhile, in Vermont the agenda could hardly be more different. Governor Peter Shumlin, a Democrat, wants to allow undocumented immigrant farmworkers to get drivers licenses, decriminalize marijuana possession and legalize physician-assisted suicide—a position virtually no other governor is willing to take. In Texas, the situation is complicated too. After enduring the most difficult budget year any Texan can remember in 2011, the state’s finances have improved to the point that business groups are pushing for new spending on water and transportation infrastructure. The story of the legislative session will be a fight between Chamber of Commerce Republicans and Tea Party Republicans over spending, says Harvey Kronberg, the editor of theQuorum Report. The Chamber wing might well win: Lieutenant Governor Dewhurst has proposed using $1 billion from the state’s rainy day fund for water projects, even though conservatives previously put the fund off-limits. 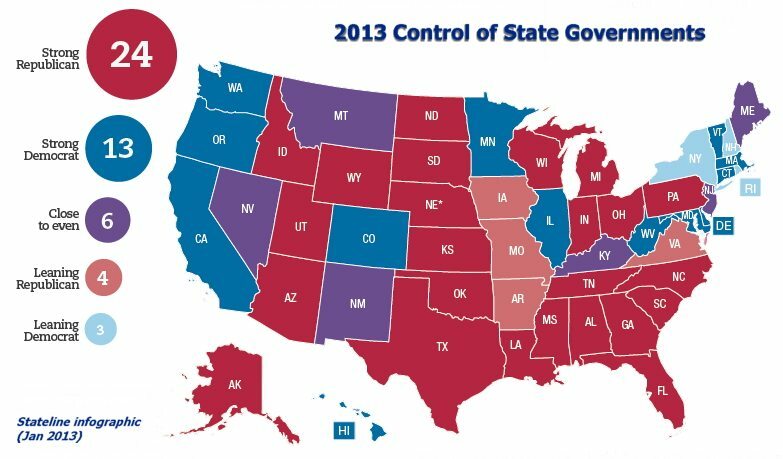 In this way, Vermont and Texas are typical of states where one party has united control of state government. Governors and legislative leaders are contemplating bold action, but, even in some unlikely places, they’re contemplating caution and moderation too. Where the minority party has no power to limit the majority’s ambitions, political calculations and a spirit of pragmatism still might. Minnesota is an example. While the majority Democrats plan to move forward with income tax increases for the wealthy, they aren’t promising to enact gay marriage, even though voters rejected a constitutional amendment banning gay marriage last year. And while some Republicans elsewhere are pushing for big income tax cuts, Oklahoma’s Republican Governor Mary Fallin is trying for only modest cuts this year, not wanting to repeat the time-consuming failure of her tax reduction plan last year. Meanwhile, a proposal to cut income taxes made by Indiana Governor Mike Pence faces skepticism from fellow-Republicans in the legislature. Perhaps most striking is the change in tone from Wisconsin Governor Scott Walker. The Republican’s decision to effectively end collective bargaining for public workers may have been the single most controversial act in state government over the past two years. It prompted a walkout by legislative Democrats, massive protests in Madison and a recall election that Walker ultimately survived. This year, Walker’s approach is totally different. He’s refusing to follow Michigan’s lead in becoming a right-to-work state—or to support any new anti-union bills at all. “Even in terms of tweaking collective bargaining or anything else like that,” Walker told the Milwaukee Journal-Sentinel in December, “I think that all those things open the door for that kind of debate and that kind of intensity.” This year, that kind of intensity is just what Walker hopes to avoid.